My boyfriend just spent nine days visiting me in Germany and it was absolutely amazing! 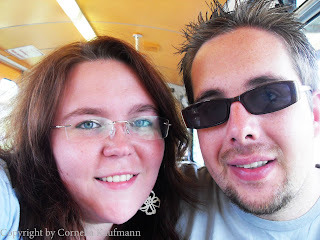 This was his second visit to my home country, but his first to come and visit me in my hometown of Solingen. He’d been to the north of Germany two years ago, long before we met. 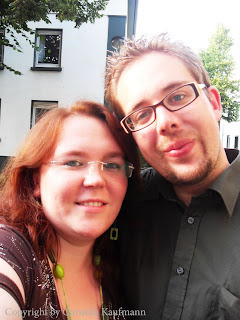 We hadn’t seen each other for 4 ½ weeks when I picked him up at Köln-Bonn Airport in the early hours of July 9th. I had visited him in Wales in June and we’d spoken on the phone and chatted most nights, but it was great to finally have him here in person. After breakfast at my favourite bistro in town, I showed him the sights, which are not too many, but included Germany’s highest railway bridge Müngstener Brücke (107m) and the castle Schloss Burg. The bit he had probably been dreading the most was meeting my parents. 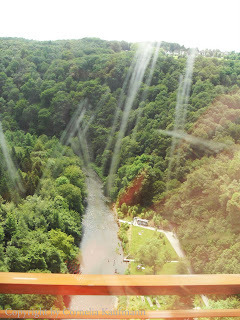 I’d arranged for us to meet them in a restaurant on Schloss Burg’s grounds for a local specialty: Bergische Kaffeetafel. It’s waffles, cherries, milk rice, cream, various sorts of bread, jams and pretzels (Burger Brezel are another local “specialty”), with loads of coffee from a traditional Dröppelminna, a kind of old-fashioned thermos. In the evening, we went out for drinks with some of my friends. I hate it when I’m invited to parties and don’t know anyone, so I figured Simmy should meet most of them before my birthday party. 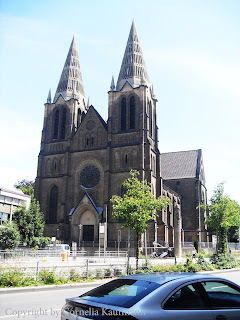 The next day, I showed him Düsseldorf, which is 30 minutes by train to the north of Solingen. Unfortunately, our German summer weather was rather British, which meant we spent a while in the Uerige pub, where we tried the locally brewed Alt beer “Uerige”. 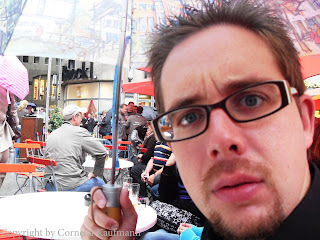 Because of the rain, we kept to the old part of town, mostly Flinger Straße and the river promenade “Rheinuferpromenade”, as well as a walk down Königsallee, or “Kö”, as locals call the expensive shopping mile. Coming back from Düsseldorf, we stayed up to celebrate into my birthday. And Simmy had the most amazing present for me! An 81-page, self-written travel book!!! I mean: Wow! Simmy actually wrote a BOOK! For ME!! Can you believe it? Do I need to point out that I was at a loss for words? 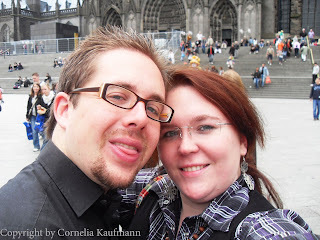 After breakfast with my family in town, we spent the rest of the day in Köln (Cologne). I had to get Simmy to sample the locally brewed Kölsch varieties. 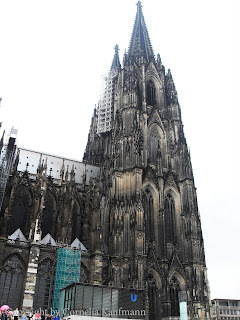 So we walked around Kölner Dom (Cologne Cathedral) and Alter Markt, with their breweries and cozy pubs, including one of the Irish kind in which Simmy could order pints in English. So we sat in the Früh Kölsch brewery's beergarden, in the rain, with our umbrellas up, waiting for our beers... it was good fun though! Unfortunately, the chocolate museum closed 5 minutes before we got there. The reason why I wanted to go to Köln on my birthday was because Kölner Lichter, an annual light show was supposed to take place that night. So we stayed around, for disappointing fireworks in the rain. The next day, I had my birthday party. I had planned to have a garden-BBQ-summer-birthday party in our garden at home, but due to the weather, we had to change location. At my gran's place is just more space in the living room, and there's a roofed terrace on which we could have our BBQ in the rain. It was great fun and everyone spoke English, so Simmy had no problems making conversation and making new friends. My friends told me, that apparently we make a rather nice couple and a friend told me that she'd marry the person who'd write her a book. For the next three days, we went on a little European adventure. Through the Benelux-countries and France, we drove my Nissan 100NX roughly 1350km on a quest to visit four cities and countries in record time. (For more infos about this trip see "A European Roadtrip"). 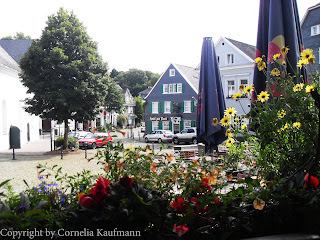 Once we made it back to Solingen from our roadtrip, we had just enough time to drop our bags off at my flat and run into town. Solinger Tageblatt's youth page editorial team had its weekly meeting, and since both Simmy and I are journalists, I wanted to introduce him. 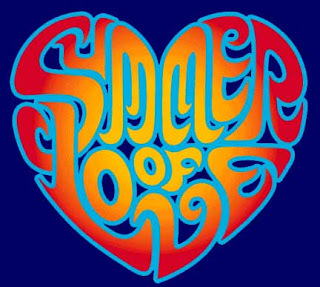 We had also previously discussed, whether Simmy could write an article for the page, along the lines of "An English man in Solingen", but I wanted him to pitch the idea to the editor again, who semed to really like it. She even agreed that i would translate the article into German for the print version, but that the original English version could go online so that Simmy could actually prove he's written for a German newspaper and people in Blighty could still read it! Thursday we took things slow. Being able to sleep in and being in no real rush was great! I also avoided driving the car, which was even better still. Even before Simmy had booked his flight over here, he'd asked me whether the stories he'd heard about "Hanging Trains" in Germany were true and whether they'd be close enough to Solingen to go and see. 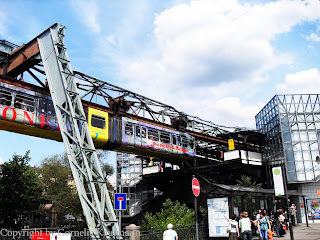 Lucky for him, the "Schwebebahn" as the hanging trains are called in German, is the tourist attraction of our neighbouring city Wuppertal. Knowing how interested Simmy is in all methods of transport, I decided on a little treat. 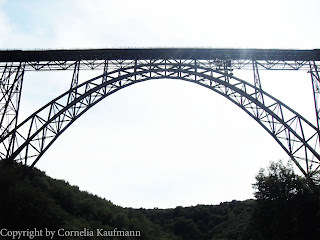 We took the train towuppertal Oberbarmen, which goes over the Müngstener Brücke - the highest railway bridge. Oberbarmen marks the end of the Schwebebahn track which runs 13 km through Wuppertal from Oberbarmen to Vohwinkel and follows the river. At Oberbarmen, we got on the Schwebebahn, which is an upside down suspension railway and therefore swings back and forth a little when you get on and off. At Robert-Daum-Platz we got off, because I had wanted to show Simmy my favourite sushi place with running buffet, but they were closed. 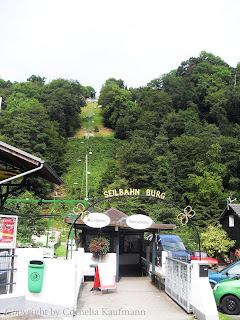 so we wandered around Luisenviertel for a while and took the Schwebebahn, which is used as daily means of commute by hundreds of Wuppertalers, to the end station at Vohwinkel. There we caught the other regional specialty transport: A Solinger trolley bus. Solingen is one of only three German cities that still have a working trolley bus network, and Solingen's network is by far the largest. That night, we dressed up a little. It was not only our last night together in Germany, but also our 6 months anniversary! Since we both have a faible for Italian cuisine, I invited Simmy to La Capannina, the most Italian Italian restaurant I could think of: dark wood, terracotta paint and great pizzas - the works. One of the two bosses (and waiters) really surprised us there. When I said we weren't ready to order yet because I was translating it all, he disappeared inside and came back with an English menu! Very considerate, I'd say! We had lovely pizzas and some wine, and the weather was good enough to sit outside. It was perfect, really. For dessert, so to say, we wandered over to my favourite bistro for some more drinks. It was strange to know he'd leave again the next night. Usually, I am the one who's leaving and going back to Germany. This time, it was the other way round. Long-distance relationships are not funny when you've gotten used to spending more time together. 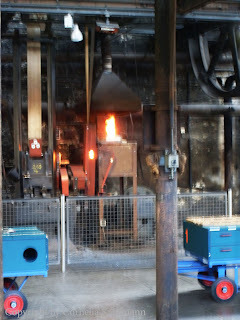 Today then, I showed Simmy the Rheinische Industriemuseum, our local industrial museum which is located in a drop forge. Solingen is famous for its knives and blade production, and the museum is a working museum. The , steam engine, drop hammer and everything there is still in daily use, and you an get a very unique Solingen souvenir from there: a scissor slug! You can see how a piece of red hot steel is transformed into a scissor's blade. And if you're lucky (or ask nicely), you can keep one. Because it had rained when we first went there, Simmy and I went back to the Brückenpark at Müngstener Brücke and the old suburb of Gräfrath to take some more pictures and enjoy one last German beer. 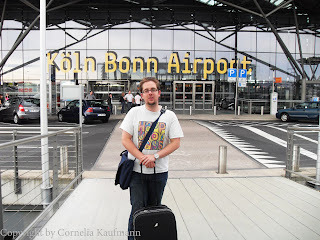 I've just returned from Köln-Bonn-Airport, where I dropped Simmy off. As I said, usually I am the one leaving and it was strange to return to the car by myself. Simmy's flight was delayed by 1 hour and 40 minutes, which meant he would have real problems getting away from Manchester airport once he landed. There wouldn't be a train connection to get him home. So I tried to change the flight, but that would have cost a fortune. I was at the airport for two hours, then we had to say goodbye because my parking time was up. I wanted him to stay, though I know it wasn't possible. He just texted me from departure lounge, that he's organised how to get home, so I guess I can stop worrying. But I can't wait to get back to England and see him on a more regular basis again! !